Missouri’s governor spent the entire day Friday in St. Louis, where he called for mutually-beneficial city and state partnership opportunities. Gov. 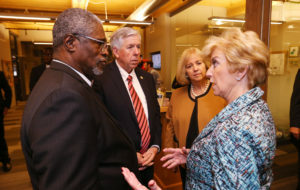 Mike Parson (R) spent the day with St. Louis Mayor Lyda Krewson and Kansas City Mayor Sly James, who are both Democrats. “Since I’ve become governor, I’ve traveled all over the state and had meeting after meeting with leaders from all parts of the state of Missouri to find out what are the two most important issues that we feel like is facing the state of Missouri,” Parson says. Parson says those two issues are infrastructure and workforce development. The governor did not mince words about how Missouri has performed. Parson and the two mayors also toured schools Friday and a non-profit startup incubator called T-REX, which provides early-stage entrepreneurs with low-cost enterprise space. The three were joined at T-REX by U.S. Small Business Administration (SBA) Administrator Linda McMahon. The SBA administrator is a member of President Trump’s Cabinet. The SBA website notes there are about 30 million small businesses in the United States. Parson, Krewson and James also toured a new apartment complex called Nathaniel Rivers, which is aimed at addressing chronic homelessness. The governor also addressed the St. Louis Board of Aldermen on Friday. Parson has signed a proclamation to convene a special session in Jefferson City that will start Monday. The special session will focus on the passage of computer science course access and STEM education, along with the expansion of treatment courts in Missouri.